Sometimes the baking mood can strike when I’m short on supplies, but as long as I have eggs, sugar, some sort of flour, and spices it’s usually possible to throw something together. It’s even easier when there is fruit that needs using before it gets too old. Today I had 3 apples, an orange, and some cinnamon. So clearly the solution was to make an apple cake. I also had some lefter over cream cheese, which we had with smoked salmon and capers on turkish bread on the weekend, so that took care of the frosting. 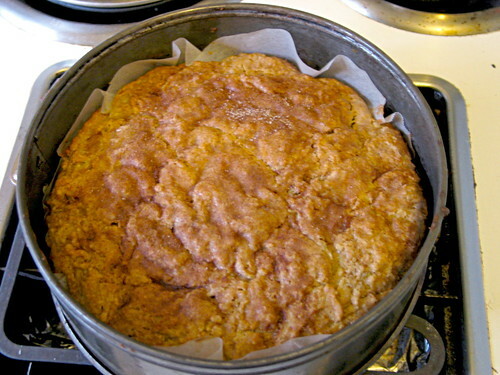 I decided to use a mix of gluten-free flour and almond meal, to make the cake dense and moist (and allergy friendly). 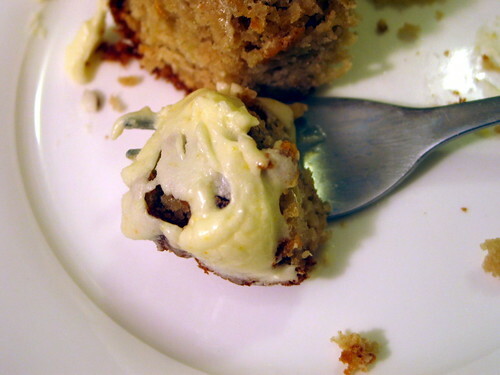 The finished cake is rich without being too sweet, and would make a pretty good tea cake just as it is, but the frosting takes it to a whole other level. Line a 21cm/8.5 inch diameter spring form pan with baking paper. Peel and grate the apples. Drizzle with the juice of 1/2 an orange and sprinkle with caster sugar and a pinch of cinnamon. In another bowl, beat together the oil and brown sugar. Add the eggs one at a time and the vanilla and 1 tsp of cinnamon. Mix together the flour, almond meal, baking powder and bicarb. Fold the flour mix and the grated apples into the bowl in alternate dollops. The resulting batter will be moist, but quite thick and gloopy. Transfer batter to pan, sprinkle cinnamon and caster sugar on top. Cook for 35mins or until skewer comes out clean. Let sit in pan for 10 minutes before turning out to cool. Beat together the cream cheese and butter until fluffy. Sift in the icing sugar and beat well. Add in the orange zest and orange zest until it tastes like enough. I like to make the frosting while the cake is baking, and refrigerate until just before using. Then I give it a good beating to fluff it up again before spreading on the cooled cake. 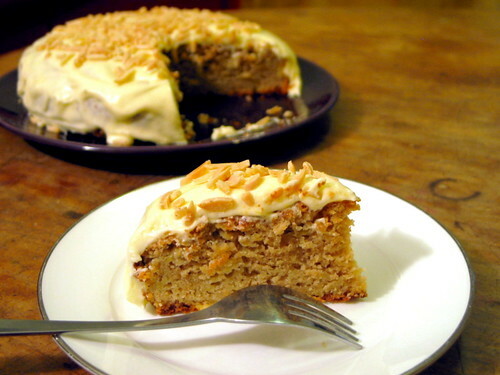 Sprinkle some lightly toasted almond slivers on top for extra prettiness and a satisfying crunch. Hope you like it. It works fine with wheat flour, but I’m always on the lookout for things which work with Gluten Free, so I can keep my friends in cake.